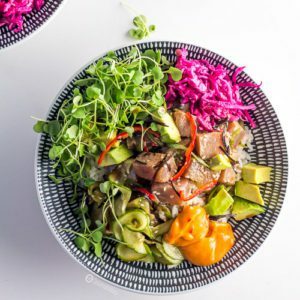 Spicy Tuna Poke Bowl is an easy and healthy recipe to make at home for a light meal. This Hawaiian raw fish salad is traditionally serves as an appetizer, but can definitely be a full meal. Ahi tuna, rehydrated dry seaweed, scallions, pickled cucumber & jalapeno, a citrusy ponzu sauce, micro arugula, avocado, spicy mayo, and topped with sesame seed. All that on a bed of sushi rice. 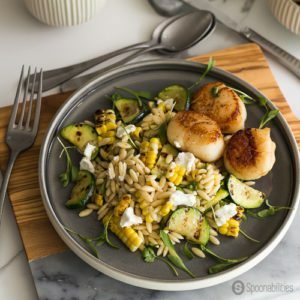 Take your salads to the next level with this Grilled Corn Zucchini Orzo Salad with a creamy, garlic mayonnaise salad dressing, a perfect buttery seared scallop, and topped with a tangy goat cheese and fresh cilantro micro greens. 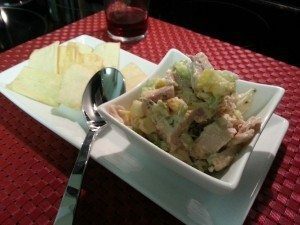 This recipe for Summer Chicken Salad & Pita Chips that uses our Fine Herbs Mayonnaise would be good for lunch or dinner.